we are very near our limit for rhizome orders. Please send your requests on the form below. You will be added to a wait list for any rhizomes we able to harvest. These orders will be shipped in the first part of June. Miscanthus (Miscanthus X Giganteus) is a "woody" perenial grass of Asian descent, that when established, will grow about 111/2&apos; yearly. This grass is sterile triploid (three sets of chromosomes) formed by a natural cross of miscanthus sacchariflorus and miscanthus sinensis. It produces new shoots (stalks) annually which average 3/8" in diameter, with 4" average cluster spread. Because it is sterile it is propagated by rhizome division. The crop is established by planting pieces of the root (rhizomes), which are cut to about 4" in length. The cold hardy grass grows rapidly (C4 photosynthesis), has low nutrient requirements, has few pests or diseases and produces high yields. Miscanthus Giganteous is a non-invasive grass that can be controlled because it has no viable seeds and runners underground. Miscanthus' photosynthetic mechanism appears to be better adapted to low temperatures than that of many other C4 crops, equipping it for high productivity under relatively cool temperatures. At full maturity it can yield up to 12 tons of dry material per acre (about fourth year on). There are higher yields being reported yearly. It shows great potential as a biomass crop. 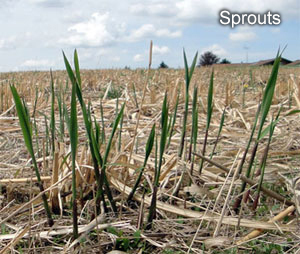 As with other bio-energy crops, the harvested dry stems may be used as fuel for heat, electricity or converted to ethanol. The rhizomes are planted about 4" deep, horizontally into a well prepared seed bed in the spring as soon as soil is workable. A little deeper if the soil moisture level is low. Europe has been working miscanthus for over ten years. They plant at one plant per square meter for establishment. Here in the U.S. we are planting at one rhizome per square yard - three foot plant spacing in rows 3&apos; apart. That rate would require approximately 4,850 plants per acre. Row layout and density is up to the grower based upon a field planted to be lifted in two years (denser) or for establishment. Also, a field planted to match equipment already owned for cultivation could change row width and spacing. Good yields can be achieved on a wide range of soils but the key to high tonnage is moisture supply. A wide range of PH is tolerated but growth is best between 5.5 and 7.5 PH. Sandy or free draining soils only yield well if rainfall is adequate so should be avoided if possible. Consider your site selection carefully for the long term commitment when planting a field for biomass. This is a crop that will produce high tons per acre for around 15 years before ton production degrades as the field chokes itself out by no open ground for the clusters to spread. Harvesting for biomass is done late winter of early spring. This allows for a low mineral and water content. At first frost, miscanthus pulls nutrients (senescence) from above ground to the rhizomes below to prepare for the next years growth. It is about a two week process. We allow the first year crop to stand. We cut down the second year growth in the spring to clear the field of old weak stalk to prep for a clean 3rd year crop. This allows for easy fertilization and spraying for any remaining weed issues. 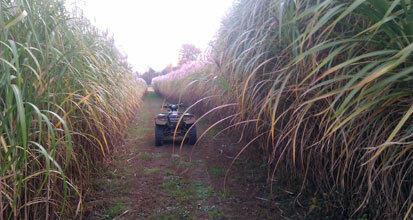 Miscanthus is being used heavily for screening roadsides and food plots. Hedge screening can be planted with wide spacing to provide food plots between, preferably planted with a strong curve to add privacy in the plot. Also, hedges are used for roadside screening and field division. Another idea is for screening your parking area and walkway to the hunting blind. A little bit of field planting can also promote bedding areas, but field planting is primarily used in the production of biomass. Planted in a 3&apos; grid, a field can choke itself out in 15 years with no open spaces. Remember, every year these rows will expand approximately 4" in each direction. The main advantages of planting an individual rhizome is cost and use of mechanized planting. An individual rhizome in bulk offers a greater cost savings when planting large acreage. Planting one year old clusters generally require digging individual holes, which increases your labor cost. The main advantage of planting a cluster is that you gain one year to full establishment (height) -- two years instead of three. Miscanthus x Giganteus is an inexpensive natural alternative hedge screening. Whether you use it for a hedge screen, focal point, or to decrease street noise, miscanthus plays a role in your yard and landscape. These plants offer you the privacy to fit your needs. Year around miscanthus offers a barricade for privacy needs, A green wall in the summer months and golden colored cane during the winter. When the leaves fall off during the winter, the cane will stand through the harvest snowfall to provide your screen coverage. Keeping rhizomes fresh until planting - Each bag has a scoop of peat moss for moisture control. 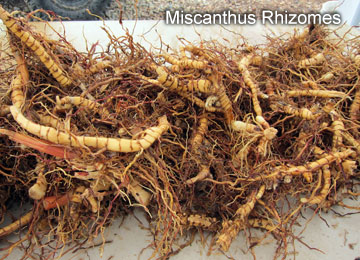 Rhizomes can be stored easily two weeks in a refrigerator or basement. The cold slows the growth. Do not put rhizomes in the freezer. Establishing a Hedge Row - We suggest the following planting pattern to establish a hedge row/screen. The individual rhizomes should be planted in a double line. Each line would be 18" apart with the rhizomes planted down these lines also 18" apart, staggered (See diagram below). Planting another line of rhizomes on the hedge row will provide thicker screen coverage at a faster pace. Planting - The individual rhizomes should be planted 3-4" deep, horizontally with nothing above the ground. A well-tilled bed does help the roots establish quicker, but is not necessary. More importantly, adequate moisture but not soaking wet (damp), and 60° ground temperature will promote growth. Do not worry so much about grass competition, but more so with broadleaf weeds that block sunshine, just during the first year of establishment. Second year growth will outpace everything. Expected Growth - The first year growth of an individual rhizome is 2-3 stalks, 3-4&apos; tall. The second year you get an average of 7 stalks, 6-7&apos; tall, and the third year the cluster's diameter will be approximately 14", with about 25 stalks at full height (11&apos;+). By the fourth year, two rhizomes planted 18" apart will grow into each another. Slower spread with heavy soil (clay) and a little faster spread with sandy loam. Maintenance/Fertilizing - Fertilizer demands are low due to the plant's efficient nutrient use and its ability to pull nutrient back down to the rhizomes at the end of each growing season. Almost every year, decomposition of the leaves, rhizome nutrient reserves, and atmosphere deposition will meet the crops nutrient requirements. After the first year, only small quantities of nutrients will be needed every two to four years to help maintain good yields. It is not necessary at the end of year to cut down the dead stalks. You may choose to let the dead stalks accumulate for the first 3 to 4 years to screen faster. It does benefit a mature row to clean up all the interior dead stalks on a 3 to 4 year rotation, after the row is 7 to 8 years old. The heaviest growth is always on the new outside spread of the cluster. We fertilize about 3 weeks after planting with a "triple" fertilizer. Keep the rate of application comparable to fertilizing new law installation. At the same time we spray 2-4D based herbicide to knock back the new weed seed germination that has taken place. and priced at $0.75/each. Minimum 10 rhizomes. • Order quantities of 1,000 or more will be counted by weight and priced by pound (addt'l 10% by vol. included). Note: 1 (rhizome) = 0.05 lbs. Approx. 20 rhizomes = 1 lb. Orders of 36,000 or more: Please call. Note: Weights will be rounded up to nearest 1/2 pound. Minimum order of 10 rhizomes. stand-alone, and not receive the same original discount. An individual rhizome is separated from a three year old (plus) rhizome cluster. The advantage of planting an individual rhizome is the cost. Individual rhizomes may take longer to establish, but the use of mechanized planting is possible, cutting down on time and labor. Therefore, individual rhizomes used in bulk offer a greater cost savings. This product is shipped bare root, without dirt. 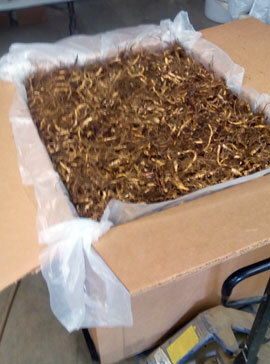 Peat moss is added for moisture control. Available only in the spring. X 0.05 est. wt./rhizm. X 0.05 est. wt./rhizm. X 62.5 lbs. X 200 lbs. *Both examples above DO NOT include shipping & handling. Use our Reservation/Request Information Form to ensure we lift/dig enough rhizomes for your order. A one year old rhizome cluster is field-grown for one season (approximately 5 - 6 months) from an individual rhizome. We then hand dig the cluster in the spring. The advantage of a rhizome cluster over an individual rhizome is you are gaining one year of growth on establishment. The minor disadvantage is that each cluster has to be hand planted and bedded in (the ground pressed and watered) in order to cut down on any shock caused by replanting. This product is shipped bare root, without dirt. Please use the form below to send your Reservation Requests for orders. If you do not receive a response within seven days, please contact us directly via phone. Thank you - Don, Maple River Farms. You may experiment with the quantities on this form to see what the estimated totals would be for your order. After entering a quantity, either press your keyboard 'Tab' button or click another form field. 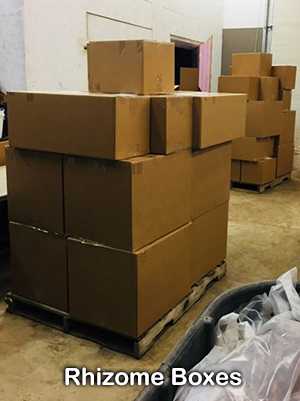 You may change order quantities and ship date at any time by contacting our office by phone or email. An asterisk (*) denotes required information must be included. Please send your requests on this form. These orders (if available) will be shipped during the first part of June. have reached our order limit for Rhizome Clusters for the 2019 season. ← Please order Individual Rhizomes. (Pots are for local pick-up only. Billing Address: * means required info. Shipping Address: Copy from Billing. This is an automatic recommended shipping date, according to an average 60° ground temperature in your planting zone. If this date doesn't work for you, click in the date box below to choose your own date. We require 14 days minimum lead time before your ship date. NOTE: We do not ship on weekends. I will pick up this order on date above. This order will be shipped. your ship date, we will contact you for payment information. In order to ensure you are a human, please complete the following equation. Click in the box after the '=' and type your answer. If you have any questions or concerns, please contact us by email or phone. The following products are available for local pickup only. Please contact us for an appointment time to pick up these products at Maple River Farms. One year old Miscanthus Pots are single rhizomes planted in a one-gallon pot and grown for one season. These are the same as a one-year cluster (above), but grown in a pot for availability all summer. This product is available for local pick-up only and by appointment only. See our Contact Info for phone number and address or submit a request using the form above. The two year old cluster has been transplanted from a one year/gallon pot and grown for an additional season. The advantage of a two year old cluster is the extra year gain of establishment time. Round and small square bales available for local pickup. Rhizomes are placed in a plastic bag without dirt but with peat moss is added for moisture control. These small bags are place in an appropriately sized box for shipping. The chart above shows an estimate of the size and weight of the boxes for shipping quantities of rhizomes. 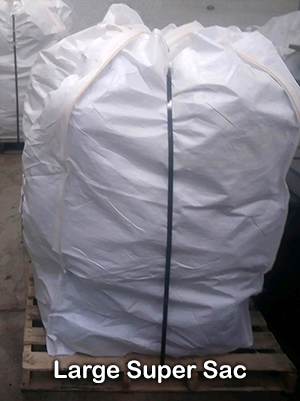 We offer supersac bags for bulk orders over 5,000 individual rhizomes. Each bag can hold approximately 5,000 - 10,000 rhizomes. A small or large supersac has individual bags within containing 125 rhizomes each, making up the order. 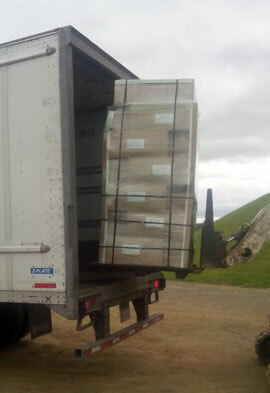 One supersac per pallet. 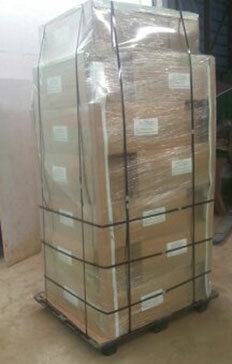 *Requirements to Commercial Ship: Commercial business address and a fork loader to unload the pallet. 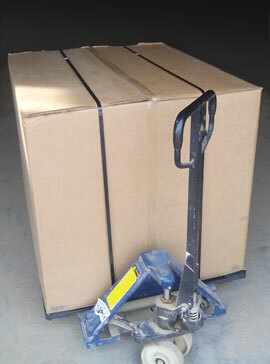 If you need additional services such as a lift gate, notify customer, or limited access the shipping cost will be higher. If you would like this service, please call us for a quote @ (989)743-4344 or request a quote on our reservation form under &apos;Questions and Comments&apos;. Due to bureaucratic procedures, you the buyer must arrange for an import permit from your government (if necessary) so that our country may issue us an export permit. We have detailed information about the miscanthus that we would be happy to share to help you obtain your import permit. 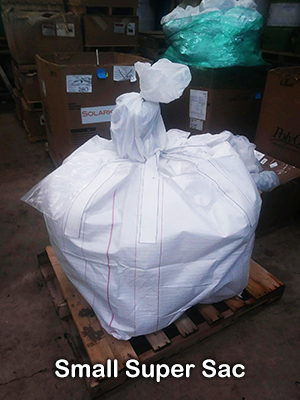 Our bulk/international shipping fits in a 48"x40"x36" box/pallet (9,000 rhizomes). The weight is approximately 700lbs. Maple River Farms is located in the heart of central Michigan in the Maple River valley. 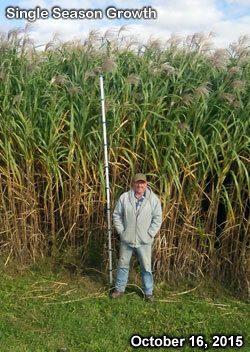 The farm was established with a goal toward introducing Miscanthus x Giganteus as a viable energy crop. Besides using the tall grass as an alternative energy source (Briquetting and Pelletizing) we have discovered that Miscanthus Giganteus makes an excellent privacy screen. In relation to that use, our deer population increased dramatically. The miscanthus field is being used as a bedding/hide area for not only deer but quail and turkey. Being that the crop is a non invasive/sterile hybrid, we supply the rhizomes so that others may grow this very amazing grass for their own needs. Follow us on Facebook to get our weekly updates on farm activities. Don't forget to follow us on Instagram too.